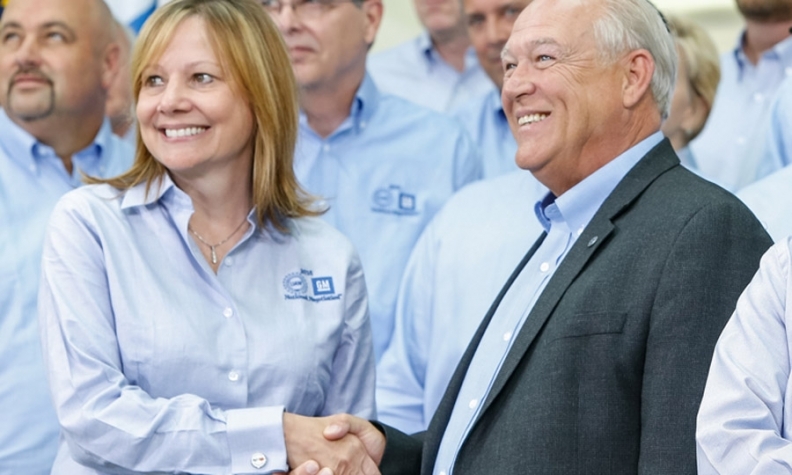 GM CEO Mary Barra, at today's handshake with UAW President Dennis Williams. GM in 2011 became the only automaker to build a subcompact vehicle in the U.S.
DETROIT -- General Motors CEO Mary Barra says GM has no plans to follow Ford Motor Co.'s move to relocate its small-car production in the face of slowing demand. Speaking during a ceremonial event to open talks with the UAW on a new four-year labor contract, Barra said GM has boosted profitability on its cars, even as demand falls amid lower gasoline prices and increased consumer appetite for crossovers. "We have some very important small cars" built at the Orion Assembly plant in suburban Detroit, including the Chevrolet Sonic, Barra told reporters and union officials at the event. "We have no plans to change that." Ford said last week that its Michigan Assembly plant in suburban Detroit will stop building the Focus and C-Max in 2018. Ford has not said where it would move production of the compact vehicles, though plant workers reportedly were told that the work would shift to a foreign country. UAW President Dennis Williams, who appeared at the event alongside Barra, declined to discuss Ford's move specifically. "It's always concerning to me, though, when any corporation invests outside the United States," he said. GM in 2011 became the only automaker to build a subcompact vehicle in the U.S., the Sonic, under a special agreement with the UAW. The pact allows GM to use a higher percentage of lower-wage Tier 2 workers at Orion, along with workers from in-house suppliers who make even less than the Tier 2 employees. Higher production costs in the U.S. generally make it tougher for automakers to turn a profit on smaller vehicles. GM has curbed production several times in recent months at Orion, where the Buick Verano also is built. The company last month told workers that it would reduce production by around 20 percent while laying off 100 employees. Barra said GM does not disclose profits by car line, but said the company expects improved profitability on cars that it soon will launch, including the Cruze compact and Malibu midsize sedan. Both are built in the U.S.
"We're seeing substantial improvement in the profitability in the way that we've engineered and process the vehicle," Barra said. Barra and Williams declined to comment on specific issues that are expected to be central to the labor talks, including the gap between Tier 1 and 2 workers' pay and health care costs. Williams downplayed the threat of a strike, even while saying that he's "not afraid of confrontation." "A strike is a failure to the bargaining teams," Williams said. "It's one of the worst things that you have to do." The contract expires on Sept. 14.